First performed in 1639, The Return of Ulysses by Claudio Monteverdi is currently being produced by Opera Atelier. It is one of the earliest operas you are likely to see performed on a 21st century stage. The timelessness of this universally-known story likely has something to do with the work’s ongoing popularity. It’s based on the second half of Homer’s Odyssey, wherein Ulysses (Odysseus), the King of Ithaca, returns home to his faithful wife Penelope. In order to reclaim his kingdom and his wife, he must fight off three evil suitors with a little help and hindrance from the gods. The Opera Atelier production is beautifully rendered and, as usual, a feast for the eyes as well as the ears. For those familiar with Margaret Atwood’s Penelopiad, The Return of Ulysses is part of the performance and narrative tradition that Atwood is reacting to. Consistent with Opera Atelier’s focus on historically-informed performances of early opera, this interpretation is traditional to say the least. The nearly four century old libretto does not leave a great deal of wiggle room for an unconventional interpretation of the characters and their motives. The music is so old it almost feels new and unfamiliar, with unexpected dissonances and harmonies arising from the counterpoint. Visually, the production is elegant in its simplicity and a true testament to the spectacular beauty that can be achieved without all of the technological bells and whistles we are now used to. Stormy waves summoned by Neptune were effected with billowing royal blue fabric that shimmered and floated off stage ethereally. The performance also showcases some highly athletic and energetic dances by the Opera Atelier’s ballet company. 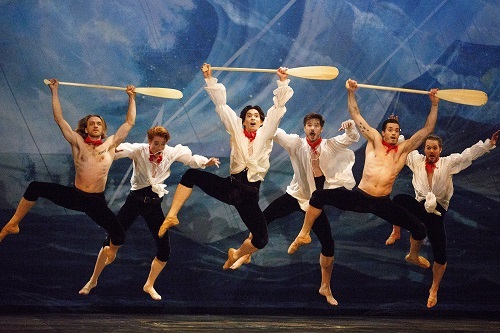 The Act I, Scene III maritime scene featuring lithe sailors with their oars is particularly memorable. There are a few large ensemble numbers where all of the dancers and singers are engaged. My companion felt the stage looked overcrowded during these numbers, detracting from the elegance of the choreography. On the whole, though, the dancing was, as usual, one of the most charming aspects of the production. The story involves a cast of characters, human and divine, and many of the singers are double cast. The score is full of intricate melodies, supported by a light score, with a great deal of room for interpretation by the conductor. Musical documentation practices were much less advanced in 1639 than they are now, and surviving scores are really more of a guideline than an instruction manual. Rhythmic documentation was particularly limited by today’s standards, so modern day ensembles must continuously strive to find common ground with regards to meter and tempo. The singers and Tafelmusik Baroque Orchestra, conducted by David Fallis, were divine, but I experienced a passage or two where it did not feel like a shared understanding of the meter had fully coalesced. The cast features a mix of Opera Atelier regulars and new artists. Krešimir Špicer is superb in the role of Ulysses. His hearty dramatic tenor voice is weighty for early music and brings the right gravitas to the role. His singing is extraordinarily supple and smooth during the sumptuous legato passages. There is also some wonderful bravura singing fit for a hero of epic proportions and his voice soared with lavish freedom on the high notes. Mireille Lebel is regal excellence in the role of Penelope, Queen of Ithaca who faithfully waits for Ulysses for 20 years (10 years at the Trojan Wars, 10 years lost at sea), while using cunning to fend off dastardly suitors looking to take control of the realm. Lebel’s performance demonstrated impressive emotional depth and consummate acting as well as singing. Her performance of Act I opening duet (Miserable Queen, sorrow and trouble never end!) with Laura Pudwell in the role of her nurse Ericlea drew me into the languid pathos of the early music. Megan Lindsay’s bright metallic soprano is fierce power personified in the role of Minerva. The thunder bolts and lighting are delightfully very, very frightening. All of the singing was quite divine and the cast received a well-deserved standing ovation. Seventeenth century music is not something you hear everyday and may take a bit of getting used to for some. Due to the familiar tale and the lyrical music, however, this work is a wonderful introduction to early music for those new to the old. Show times are 7:30 PM on April 21, 24, &27; with additional matinees at 3 PM on April 22 and 4:30 PM on April 28.